Q. 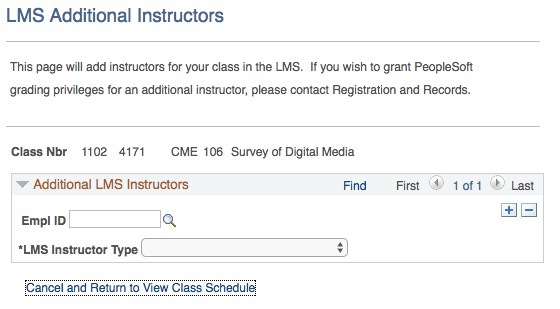 How do I add another Instructor to my Moodle course? The current instructor must go to https://my.butler.edu/ to add more instructors to their Moodle course. Please consult the My.Butler Help page for more information. Select Enter Addl LMS Instructors for the course you want to add someone to then add the information required and select Save. Note: An additional step of contacting R & R is required for the added instructor to have PeopleSoft grading privileges. Now that the new instructor has been added to Moodle you will need to go to the course and ENROLL them as an instructor. For assistance with this procedure please submit a ticket to the Help Desk at itrequest.butler.edu.